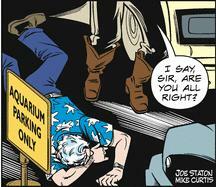 Arthur Curry was the director of the City Aquarium who stumbled across former employee, Phishface’s secret hideout in the Aquarium facility. Phishface killed him and dumped his body in a nearby parkling where it would be found by Vitamin Flintheart. Phishface was eventually caught and went to jail for his crimes.